Thank you for choosing Telerik RadListBox! RadListBox is a Silverlight control used to display a list of items from which the user can choose. 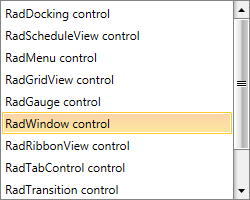 The control has a number of advanced features like multiple selection, autocomplete, keyboard support, drag and drop, as well as rich customization capabilities. Selection: RadListBox provides three selection modes - Single, Multiple and Extended. Read more about this in the Selection article. AutoComplete: When the control is focused, the first matching item is selected while the user is typing. Read more about this in the Autocomplete article. Drag and Drop: Take advantage of the built-in drag and drop support to reorder items or move them from one RadListBox to another. Read more about this in the Drag and Drop section. Keyboard Support: RadListBox supports several keyboard shortcuts for performing the most common task. Read more about this in the Keyboard Support article. Theming: As any other control from the UI for Silverlight suite, RadListBox comes with different themes. Read more about this in the Styling and Appearance section of the documentation.